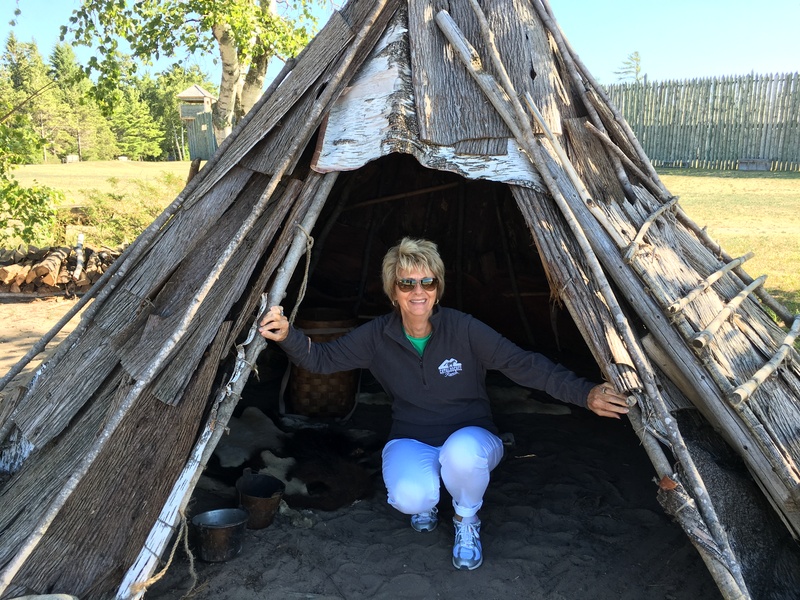 Michlimakinac Fort – Let's Go RVing! Winter has come back to Michigan. Well, not really but it did get cold last night and when Jerry got up this morning it was 57 in the coach (we didn’t turn on the heat last night). Thank goodness for the fireplace. I almost feel guilty thinking about our cool weather because it is sweltering at home. After realizing that the bike rack would not work we went back to Petoskey to return it and then ended up stopping at Latitude 45. A very helpful young lady found the very one we needed and helped Jerry put it on. That done we headed for Mackinaw City to do some touring. 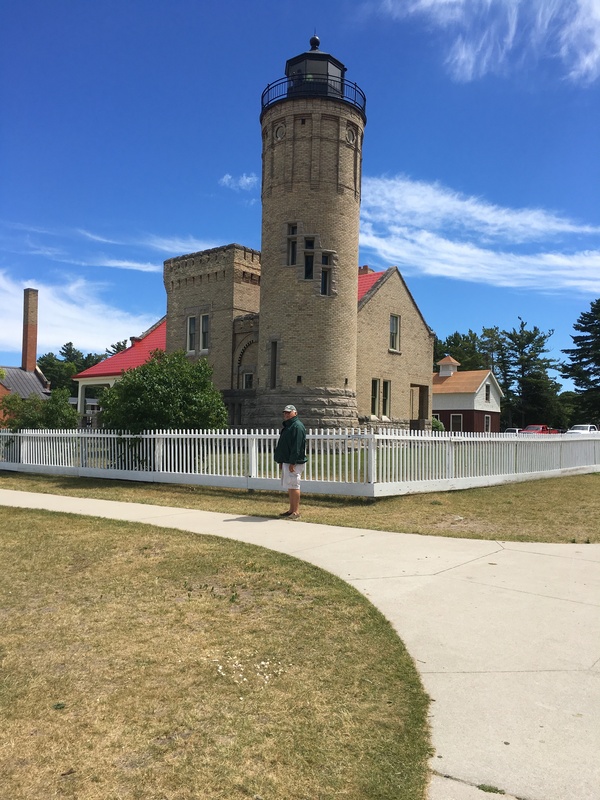 Our first stop was the Mackinaw Point Lighthouse. It is probably the nicest lighthouse we have visited with a lot of memorabilia. Several people were dressed in period costumes and gave various presentations. We climbed up to the top, only 50 steps up a spiral staircase and then 8 up a ladder. The top was enclosed but the view was still spectacular. 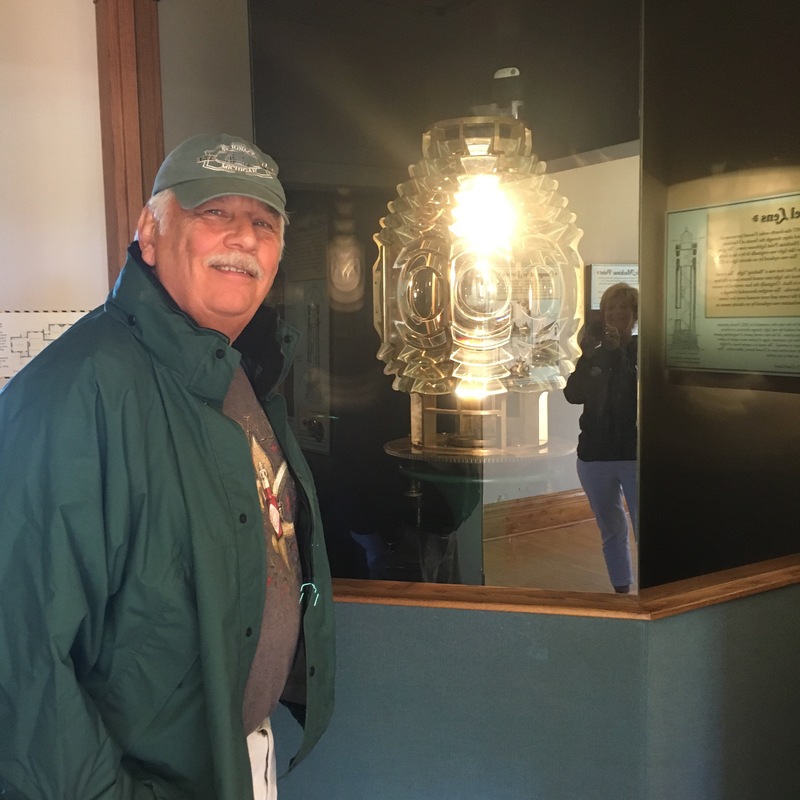 On the ground floor of the lighthouse is an original Fressnel Lens that guided the ships through the Straits of Mackinac from the top of the lighthouse. Originally lit by a large kerosene lamp at its center this was replaced by an electric light in 1929. Also located on the lighthouse grounds is a Maritime Museum and it too is very nice. We learned about the Mackinaw Straits and the danger they offered. We also read about the captains that were more interested in getting the cargo delivered on schedule than they were about the lives of their crewmen. There were several ship wrecks where lives were lost. One particular disaster was deemed the responsibility of the captain and he was unable to captain for a year, however he never sailed again. Our next stop was the Michlimakinac Fort. Like the lighthouse it had many presentations by people dressed in period costumes also. Through archeological digs many of the relics of the fort have been recovered. In fact Michlimakinac is the site of the longest, on-going historical archeology program in the United States. One of the highlights was the firing of the cannon “into Lake Michigan”. Actually the firing range was so low that they seldom fired at anything in the lake. 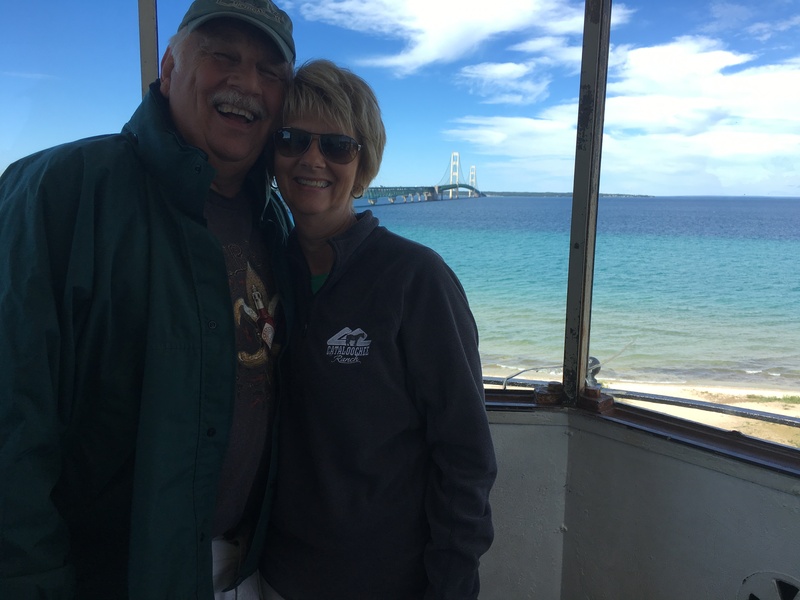 After we left the fort we rode into Mackinaw City, sampled some fudge and bought a t-shirt for Jerry then headed back to St. Ignace. We had talked about the possibility of biking into St. Ignace for dinner but wisely decided that we were too tired and hungry to do that so we stopped at the Galley and had dinner. I had broiled whitefish and Jerry had fried whitefish, trout, walleye and perch. Neither of us had ever had whitefish or walleye before. We topped it off with rhubarb pie and ice cream! I had been told that rhubarb pie is a staple of Michigan so I wanted to try it. I’m glad I did. Now I can go back to my delicious cherry pie! When we got back to the campground we got out the bikes and went for a ride. I could only do three miles (and was glad to do that) but Jerry did his regular six. We are undecided about what to do tomorrow. We had planned to go to Saulte St. Marie to see the locks but I talked with a lady in the campground who had gone on Wednesday. She saw two ships go by and one of them was a tour boat. In fact she said that she was bored! Apparently due to coastal deterioration the drop between Lake Superior and Lake Huron is not as large as it used to be so fewer ships are going through. Since we had actually experienced the journey of a boat through a lock when we were in New York we may decide to skip that. We may even go back to Mackinaw Island – we’ll see!